We love our summer interns. This week we want you to meet Joey Maloney, the engagement intern. In this post he shares about his trip to Ethiopia. Sean is a filmmaker and had met the first sponsored Ethiopian skateboarder weeks earlier on an airplane completely by coincidence. So we decided to embark upon this adventure. Sean, myself, our skateboarding friend, Abenezer Temezken, or AB for short, and our hired driver, Ayu, left Addis Ababa heading north on a dusty summer morning. 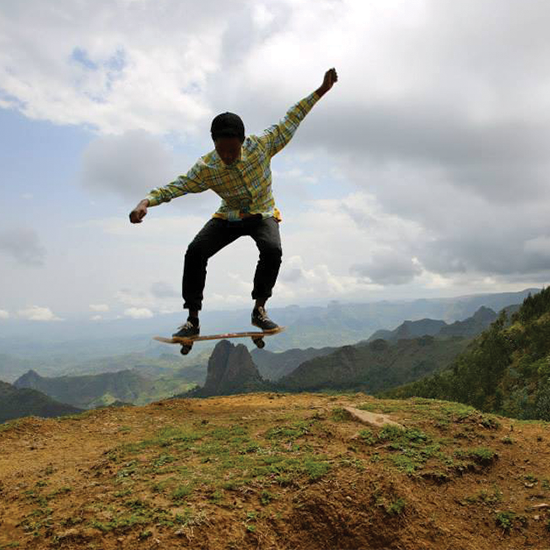 We went from town to town in northern Ethiopia, drinking the best freshly squeezed juices (mango, avocado, passion fruit, to name a few), squeezing ourselves into the cheapest hotel rooms (two or three to a bed), and capturing the phenomenon of skateboarding in a culture that had never seen such a thing. We would go into town squares where large groups of people would gather and watch in amazement. Toward the end of the trip we stopped in Lalibela to experience firsthand one of Ethiopia’s holiest cities. Entering the city felt like falling back in time hundreds, if not thousands, of years. The roads of Lalibela were made of dirt, so in this city there would be no skateboarding, which was fitting because it felt too holy for such a youthful activity. Being foreigners, we had to pay an expensive fee to get in to see the churches but it was definitely worth every birr (Ethiopian currency). Lalibela is composed of 11 monolithic rock-cut churches, and when you enter into the first church you are struck with a sense of awe and wonder. It is said that the Saint Lalibela saw Jerusalem and then tried to create a new Jerusalem after it had been taken over by Muslims. It is very humbling to see the architecture and to touch the smooth rock on the inside of the churches. In between leaving one church and going to the next we saw a priest who was wearing dark sunglasses. It was so funny because he looked like a straight-up G. We laughed, took a picture, and kept walking. St. George was the most spectacular church, and it clearly stood out from all the rest. It was cut out of the ground in a cross shape and upon entering I could tangibly feel the sacredness in the air. I almost felt unworthy to enter such a holy place. After visiting the churches I was left in a state of awe. We walked around the humble town and I met some of the local children. I laughed with them as I took pictures then showed them what they looked like. It was a special day that was filled with the views of captivating world wonders as well as the simplicity of finding joy in the little things, which children do so effortlessly. I was reminded how beauty can take on so many different forms.